EcoTeach offers educational trips and real world experiences for students and teachers. Find out more about our customized trips. From endangered sea turtles and gregarious monkeys, Costa Rica offers the chance to see extraordinary wildlife, plant species and diverse ecosystems up close and personal. Exploring life in the Amazon and giving back through service helps students expand their vision of their own future and their place in the world. Straddle the earth’s hemispheres at the equatorial line and experience boundless biodiversity and spectacular natural wonders. 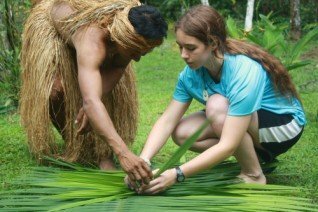 Our educational trips are jam packed with hands-on ecology work, authentic cultural exchange and real-world encounters. We carefully select activities and experiences that impart life-long impressions on our travelers and the communities they visit. It's easy we'll walk you through the steps. We specialize in providing educational trips to Costa Rica, Peru and Ecuador for student groups, teachers, families and individuals. Led by experienced naturalists, our itineraries are reasonably priced, all inclusive, and can be easily customized to meet your needs! When you work on community-based projects to protect sea turtles or the rain forests, you know your trip will have a powerful impact on the environment, the local people and your understanding of the world.